Counter-terror detectives are continuing to search for clues about about how an armed attacker brought death and destruction to the streets of London on Wednesday. Five people were killed in the "sick and depraved" terror attack, including a police officer who was stabbed and his assailant. Mark Rowley, Scotland Yard's top anti-terror officer, confirmed that 40 people were injured after the attacker - armed with two large knives - mowed down pedestrians with his car on Westminster Bridge then rushed at the gates in front of the Houses of Parliament, stabbing a plain-clothes policeman before he was shot by armed officers. The officer who died was named as Keith Palmer, 48, a husband and father, whose bravery was hailed by colleagues, friends and the many British MPs whom he was charged with protecting. Paying tribute to Mr Palmer, Scotland Yard's Mark Rowley said: "He was someone who left for work today expecting to return home at the end of his shift - and he had every right to expect that would happen." The three other fatalities are understood to be people who were hit by the car on Westminster Bridge. Mr Rowley declined to name the attacker, but said police suspect he was "inspired by international terrorism" - and that they believed they knew who he was. BBC Newsnight reported there was a suggestion the car used in the attack was hired from an address in Birmingham. However, this has not been confirmed. Armed police were involved in a raid at a residential property in the city late on Wednesday night, with Hagley Road reportedly closed for about 3 hours from 11pm. There is no indication that the raid was linked to the attack at Westminster. 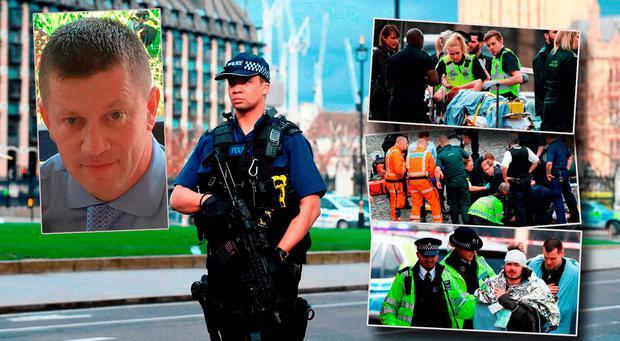 Witnesses described scenes of terror when gunfire rang out as the attacker approached a second officer within yards of the Houses of Parliament. The suspected attacker was pictured being treated by paramedics on a stretcher, as two knives used in the assault lay on the ground nearby. Paramedics fought to save his life and that of Mr Palmer on the floor of the cobbled courtyard in front of Parliament, with British Foreign Office minister Tobias Ellwood among those who rushed to help. "Heartbroken" former colleague, Conservative MP James Cleverly, paid tribute to the "lovely man" he had known for a quarter of a century. "I've known Keith for 25 years. We served together in the Royal Artillery before he became a copper. A lovely man, a friend. I'm heartbroken. "My thoughts are with the family, friends and colleagues of Pc Keith Palmer. A brave man." British MPs said that the terror attack could have been prevented if police on duty at a well-known security “weak spot” had simply kept it bolted. The killer managed to get in through a vehicle gate in New Palace Yard – used by the Prime Minister and other members of the Government – because it was not locked. British Prime Minister Theresa May has described the attack as "sick and depraved". Speaking outside 10 Downing Street after chairing a meeting of the Government's Cobra emergencies committee, Mrs May paid tribute to the "exceptional men and women" of the police force who responded to the attack. Mrs May said that any attempt to defeat the values that Parliament stands for was "doomed to failure". And she vowed: "We will all move forward together, never giving in to terror and never allowing the voices of hate and evil to drive us apart." 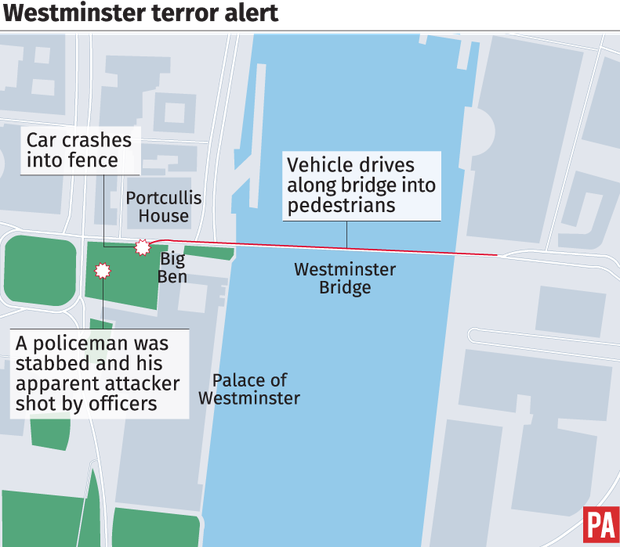 Footage later emerged of the moment police opened fire after the attacker drove a grey Hyundai i40 across Westminster Bridge before crashing it into railings then running through the gates of the Palace of Westminster. In other developments, another woman who apparently fell into the Thames was rescued and given urgent medical treatment on a nearby pier. London Ambulance Service said paramedics had treated at least 10 patients on Westminster Bridge. A party of French schoolchildren were among those targeted on the bridge, with three injured. Mrs May, who was ushered away from Parliament after the attack, was chairing a meeting of the Government's emergency Cobra committee. The attack left a trail of destruction as paramedics tended to victims on the bridge and at the gate. Witnesses said the attacker was shot by police as he approached a second officer clutching his knife during the incident at about 2.45pm. That carnage was followed very shortly afterwards by a crash outside the House of Parliament, followed by a stabbing of a police officer and a number of shots being fired. A number of officers were injured in the struggle. Eyewitness Rick Longley described the attack at Palace of Westminster. "He had one gunshot wound to the right side of his chest. I don't know if he was dead or alive, but people were working on him. "I saw that needed medical attention and I asked if I could help because I am a doctor, but they said they were fine. "Then the police moved us back." 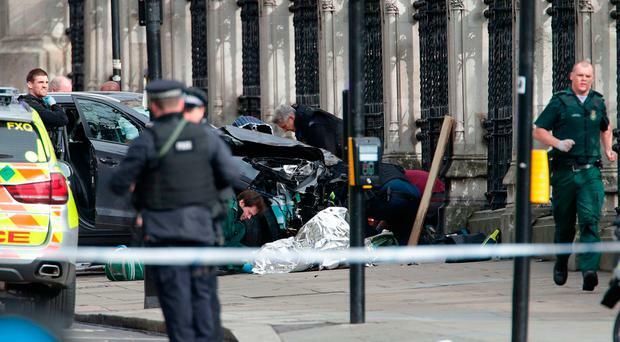 President Michael D Higgins expressed the sympathy of the Irish people with the families of those who have lost their lives and to those who have been injured, resulting from the terrible attack in Westminster. President Higgins will be writing formally to Her Majesty Queen Elizabeth II and to the Mayor of London, Sadiq Khan, to express the sympathy, condolences and solidarity of the Irish people with our neighbours at this difficult time. The Irish embassy in London say they are monitoring the situation. Anyone with serious concerns for Irish people can contact +35314082527/+44 20 72352171. We are monitoring situation in #Westminster #London. The Department of Foreign Affairs later confirmed that they were not aware of any Irish caught up in the attack. Foreign Affairs Minister Charlie Flanagan said: “I unreservedly condemn the attack outside the Houses of Parliament at Westminster today. I deplore the loss of life, and note that the casualties include a police officer killed in the line of duty. I wish to extend my condolences and on behalf of my Government, my support to the people of London and the UK. Terror and violence will never triumph over democracy. Britain is on its second-highest level of "severe" meaning an attack by militants is considered highly likely.